Recommended as a biologically active food supplement, an additional source of vitamin E, beta-carotene, omega-3 polyunsaturated fatty acids and flavonoids. 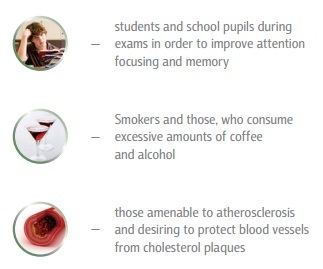 Those prone to atherosclerosis, wishing to protect their blood vessels from cholesterol upswing. Recommended for adults to take 1 capsule in the first half of the day during meals with water. Keep at room temperature (not exceeding 25°C) in a dry place, protected from light out of reach of children. 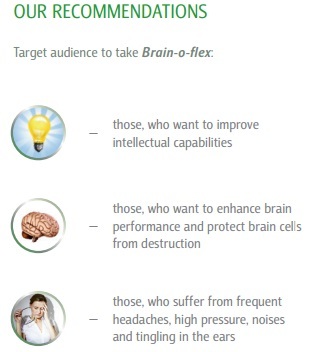 Brain-o-flex ingredients participate in renewal and regeneration of brain cells and nerve tissue, accelerate neural transmission. Ultimately balanced and comprehensive “smart” formula for brain activity is enhanced by omega-3 PUFAs, whose efficiency for supporting mental activity has been scientifically confirmed.